While adults can typically push through anxiety for the sake of maintaining oral health, for children, it isn’t so easy. In fact, research shows that children who have high levels of stress are actually more likely to develop dental issues. Since visiting the dentist can be a key cause of stress, this can eventuate into a vicious circle. However, at our child-friendly Berwick dental clinic, we have come up with some top tips to break through this circle, and today we’re sharing them with you. A fear of the unknown is far worse than knowing what is ahead of you. It’s the same principle when you take your child to the dentist. Always let your child know that an appointment is coming up, and some things that they can expect to happen during the check-up. At the same time, when faced with tough questions, try to remain honest without revealing any extra details that might scare your child. Keep it short, sweet and simple. When discussing the dentist, using words with negative connotations such as “pain”, “hurt” or “needle” can make the dentist sounds scary, causing your child to feel more anxious. Instead, try to use positive language, which includes words like “clean”, “healthy”, “sparkly” and “strong”. This will help to reinforce that visits to the dentist are a good thing. The way your child views the dentist is all about mindset and predictability. Playing ‘pretend dentist’ can help ease him or her into a positive mindset that shows them what the dentist will be like. It also makes the dentist seem more fun and exciting. Reading positive books or watching affirmative cartoons about the dentist can really help your child to form an optimistic opinion about the dentist. It may even be helpful to mention that you visit the dentist too – although, you should avoid revealing any negative dental experiences you have had. As a parent, you are going to have to prepare for the possibility of your child having an adverse reaction to their dental check-up. In this situation, it is important to stay calm and allow the dentist to help relax your child. Sometimes, it can even help to bring a favourite soft toy or blanket to ease the anxiety your child may be feeling. Going into the dentist’s office a little early can help your child get to know their dentist and feel comfortable with their presence before beginning the check-up. The dentist will also be able to ease into the check-up by asking questions and starting conversations with your child. Dental checks should generally begin by the time your child’s first tooth is visible. Not only is this important for children’s dental health, but it also helps them to grow accustomed to the clinic at a very early age. Try to visit bi-annually even before your dentist recommends it, as this will help make dental check-ups feel like a routine, rather than a nerve-wracking ordeal. 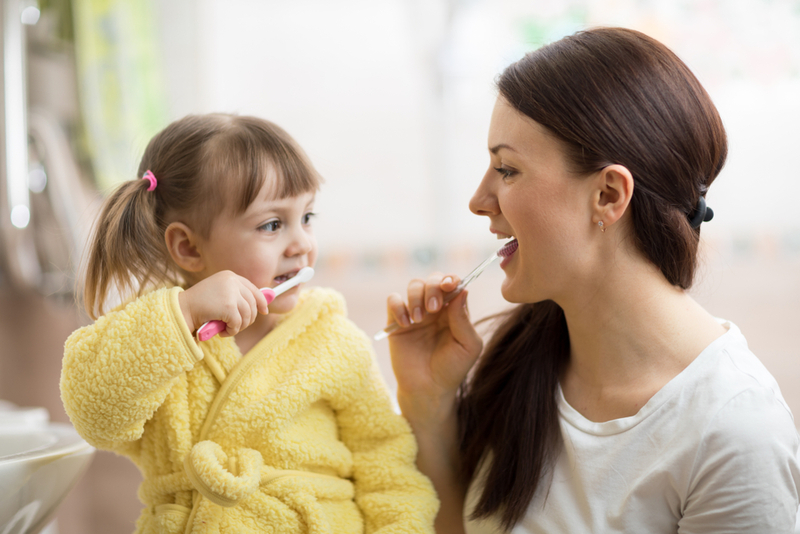 You may think it’s a good idea to bring your child along to your adult dental appointment but think again: you probably have your own apprehension towards it! Seeing you feel anxious about the dentist can have a carry-on effect on your child when it comes to their time to visit. Instead, visiting a paediatric dental clinic is going to make dental appointments much more comfortable for your child, as these clinics often design their offices in a way that will help children relax. This usually involves games and toys in the waiting room, and colourful posters and drawings in the dentist’s office. At Eden Rise Dental, our philosophy is centred around being a family-friendly clinic that helps everyone’s smiles sparkle, from the youngest in the family to the oldest. Since 2001, we have helped children overcome their dental anxiety, thanks to our friendly all-female dentist team who are experts in making children feel comfortable with their oral health. To book an appointment at our child-friendly Berwick dental clinic, don’t hesitate to give us a call on (03) 9702 6111, or fill out an online form today.